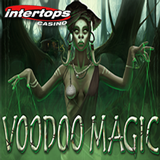 Just in time for Halloween, Intertops Casino has introduced a bewitching new slot game from Realtime Gaming called Voodoo Magic. The 13 line game has stunning artwork and eerie effects featuring a wild Princess and her Voodoo Dolls and you can get a nice casino bonus to try it with. Intertops will add 50% up to $100 to your deposits. To claim this casino bonus, enter coupon code VOODOO as they deposit. This bonus is available until November 5th only. Voodoo Magic's Scatter is a Voodoo Doll and all Scatter wins give up to 25 free spins where the Magic Multiplier increases the multiplier with each free spin. Meanwhile the $120,000 Bullseye Casino Bonus event continues to give bonuses up to $500 to the top 20 players on the contest leaderboard every Monday until November 3rd.